Today we share with you how to test before excavation construction steel sheet pile, we want to help. Sheet pile material inspection and appearance inspection, if it is welded steel sheet pile, weld inspection will be carried out. Typically our Foundation temporary sheet pile retaining structure, mainly to do visual inspection, the steel sheet pile for the shape does not meet the requirements to correct (specific methods can be found in the steel sheet pile repair correction, in order to reduce the piling process difficulties. Visual inspection: including height, thickness, end squareness, surface defects, length, width, flatness and shape other items of locking content. ⑴, affecting the fight welded steel sheet pile cut off to be taken. ⑵, reinforcing sections defects and cut holes. ⑶, found severe corrosion of steel sheet pile, concrete section thickness must be measured, it is determined to facilitate the calculation need not require reduction. Material test: is a comprehensive test sheet pile base metal chemical composition and mechanical properties. It includes analysis of the chemical composition of the steel, tensile member, bending test, locking strength and elongation of test test items of content. Each specification sheet pile at least a stretching, bending test. 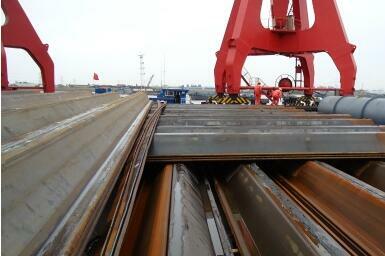 Steel sheet pile 25 ~ 50t should be carried out every two test specimens. How everyone excavation before construction inspection sheet piles have additional questions about this topic welcomed us along with Ligang industry links. Our address is conveniently invest 5 billion yuan in the immediate vicinity of the Yangtze River logistics, formed a scale enterprise with an annual capacity of 1 million tons.